Some of my favorite dishes at Luce & Hawkins are the ones that are the simplest. With simplicity comes knowledge in your craft, and confidence in your food. This dish is a perfect example of both those things. This was on our tasting menu back in October. I've just now gotten around to posting it. 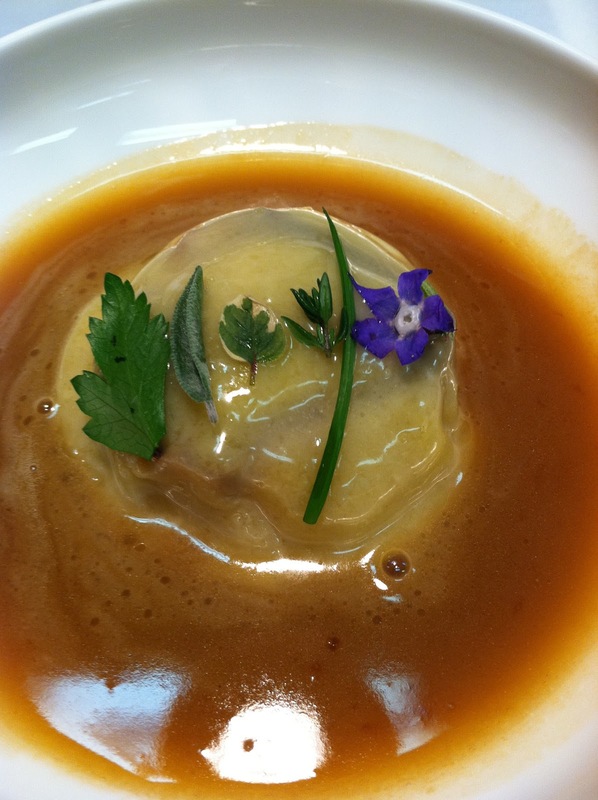 The dish focuses on a single raviolo (more than one would be ravioli). The real killer, is that the course is comprised of three proteins not typically associated with each other. Chef Luce artfully combined the three harmoniously, creating a combination that was not only new and original, but also very secure in it's effectiveness. 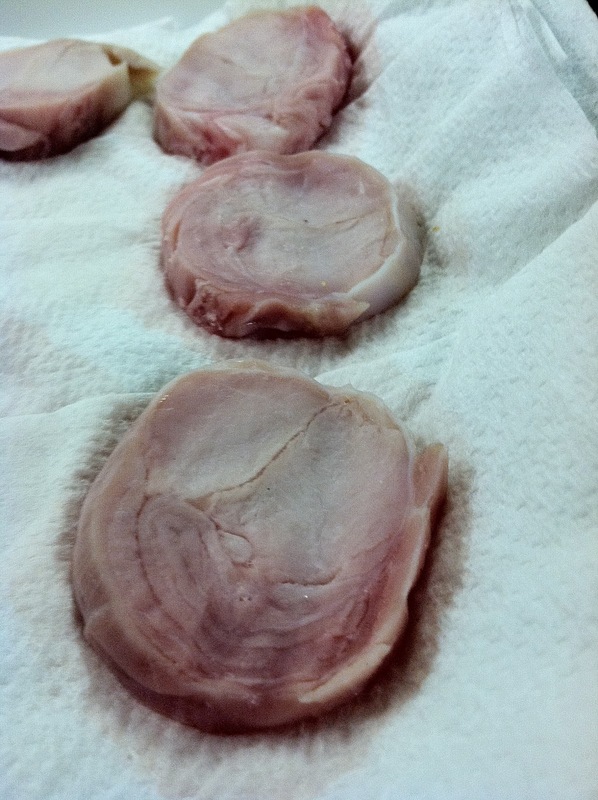 First, loins of rabbit are trimmed and seasoned. This blog gives an excellent lesson in breaking down a whole rabbit. A few brushstrokes of Transglutaminase or "meat glue" as it's commonly known as, are applied to the insides of the loin and belly. The whole kit and kaboodle is rolled within the belly and compressed overnight in a sweet and sour broth (chicken stock, vinegar, sugar, shitake mushroom). The next day, the loin are poached sous vide at 64 degrees C for 12 minutes. The low cooking temperature ensures that the loin and belly is both cooked through and tender. Once cooled, the rolls of loin are sliced thinly, and seasoned again with a little salt and pepper. 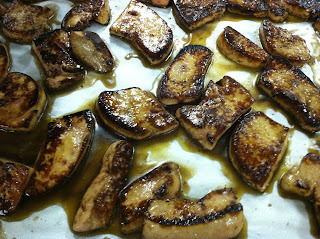 Next, slices of foie gras as seasoned liberally with salt and pepper, then seared lightly on both sides. The foie is chilled, making it a little sturdier when the pasta making process arrives. Finally, the two are combined, the foie on top of the rabbit, and the raviolo is formed. A little hint from Chef Luce that has really helped when making fresh pasta. A small pinch of ascorbic or citric acid to your pasta dough will help it to retain that bright fresh yellow color for much longer. It won't be detectable in the finished product. The pasta is warmed in a little buerre monte (a simple emulsified butter sauce), placed in a pool of rich lobster broth (yet another protein! ), and finally garnished with garden herbs. The combination of these three animals is needless to say, surprising. The lean meaty rabbit offers a sturdy support to the rich fatty duck liver. The two are beautifully brought together by a rich roasted lobster broth. Shellfish has always paired well with meat, but this combo is on another level! All I can say is without tasting this one for myself I might not have believed in the dish's success. I am now a believer! Amen and Hallelujah! The moral of this story: Sometimes (heck, most of the time) simple is better. But simple does not mean boring or ordinary. Do not confuse those two words.